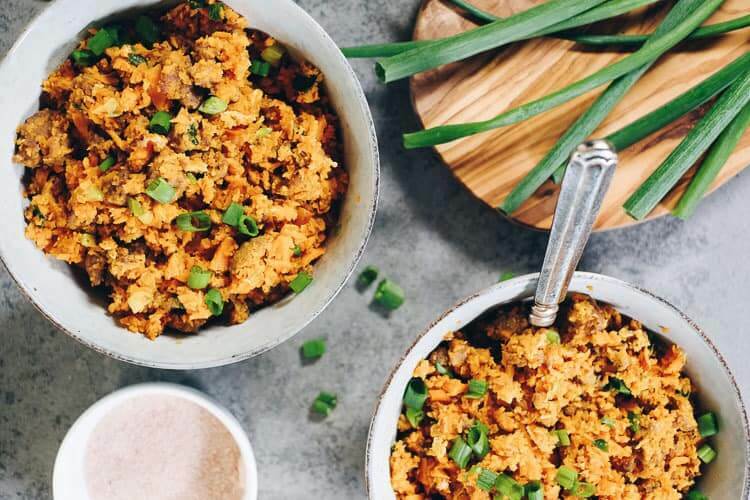 Oh boy, this is such a delicious and healthy twist on pork fried rice! 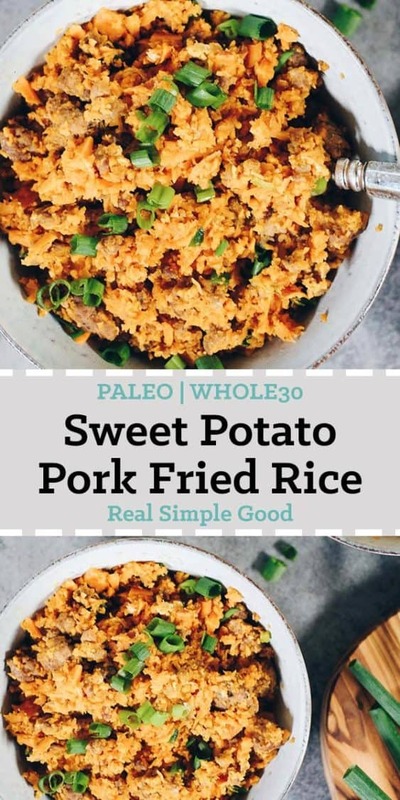 We love making Paleo versions of some of our old favorite dishes and replacing the ingredients we don’t eat with real food versions. 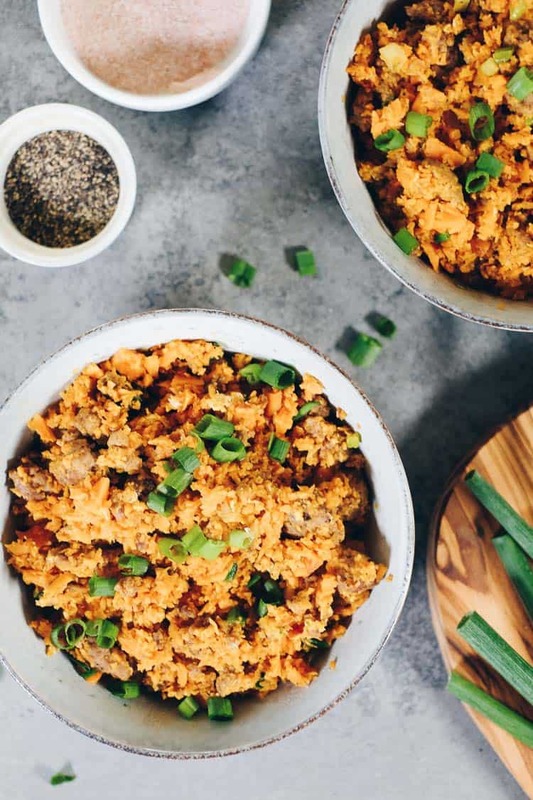 This one turned out really great, as this sweet potato pork fried rice is a unique recipe with classic “fried rice” flavors. Making the rice for this recipe is actually really easy! You just cut the sweet potatoes up into chunks and throw them in the food processor. Let the food processor do its thing and the sweet potato will be pulverized into rice-like bits in no time. We did our “ricing” in batches for this recipe, because 3 potatoes was too much for our processor. Filling the processor up about halfway is perfect, as you can over-process the sweet potato if you aren’t careful. Don’t over process, or you’ll end up with a mushy sweet potato mixture in your food processor. There, I said it! I really think this sweet potato pork fried rice is better than the takeout version. While I used to love fried rice on occasion, I remember it being overly greasy and unsatisfying. Oh, and it usually had peas in it, not my favorite. Don’t worry, it’s only simple, real food ingredients in this recipe and you’ll be enjoying fried rice without the grease or peas! 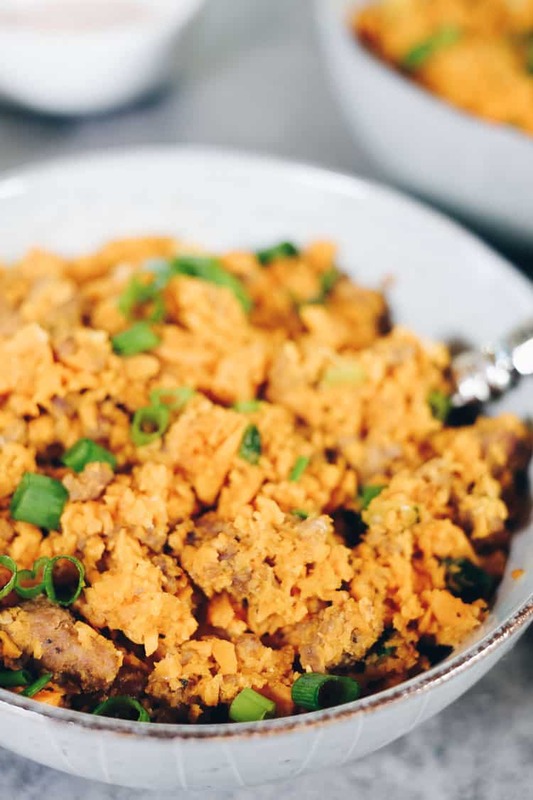 The best part about this sweet potato pork fried rice is how easy it is to make. With only seven ingredients, you’ll have this healthy and delicious meal on your table in no time. No need for takeout cartons here, we’ve got something that tastes better and leaves you feeling full and happy after dinner (no more of that greasy, guilty feeling). 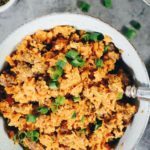 Go ahead and make your own sweet potato pork fried rice for dinner the next time you are craving takeout! Then, take a photo and show us how yours turned out. Tag us on Instagram @realsimplegood, so we can see! Also, let us know what you think by leaving a comment below. A delicious and healthy twist on pork fried rice! 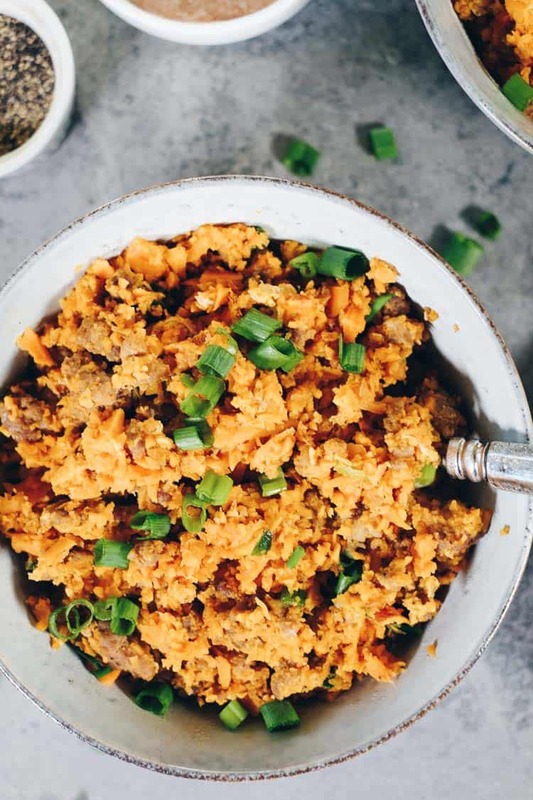 This sweet potato pork fried rice is a unique recipe with tons of flavor. Chop sweet potatoes into small chunks and add them to a food processor using the chop blade. Pulse in the processor until the sweet potatoes are broken down into small, rice-like pieces. (You may have to do this in 2 batches, only fill the food processor halfway full to allow it to process. Don't over process, as potatoes will turn to mush). In a large pan over medium-high heat, add pork to brown. Season with salt and pepper. Break up into small bits and cook until it has developed a brown crust, about 8 minutes. Drain fat if desired, reserving at least 1 tbsp in the pan. While the pork is cooking, cut up green onions. Add sweet potato rice to pan. Add the green onions, coconut aminos, fish sauce and cayenne. Mix well. Cook for 5-6 minutes, stirring occasionally until the sweet potatoes start to soften. Crack the eggs into the pan and stir them around to scramble. Continue to stir until the eggs are fully cooked, 2-3 minutes. Taste and season with additional salt and pepper as desired. Recipe looks awesome! How does it hold up as leftovers? How many calories in this dish, per serving? Hi there! As part of our Paleo lifestyle we actually do not track calories. We just focus on eating nutrient dense, real food and listen to our bodies. It’s one of the most liberating parts of our lifestyle, not being so attached to calorie counting and it has really helped to improve our relationship with food. Hopefully that makes sense. We hope you give our recipe a try! ? If I don’t have a food processor do you think I could grate the sweet potatoes for a similar texture? I appreciate your opinion! This sounds – and looks – delicious! Hi there! We haven’t tried it but I think you could use grated sweet potatoes. You’ll definitely need to cook the potatoes longer than noted in the recipe, because they cook pretty fast after they are chopped into bits in the food processor. So, just cook the potatoes until they are softened and cooked all the way through. Good luck and let us know how it goes!